A solar cell made from a monocrystalline silicon wafer. A solar cell or photovoltaic cell is a device that converts solar energy into electricity by the photovoltaic effect. Sometimes, the term solar cell is reserved for devices intended specifically to capture energy from sunlight, while the term photovoltaic cell is used when the source is unspecified. Assemblies of cells are used to make solar panel, solar modules, or photovoltaic arrays. Photovoltaics is the field of technology and research related to the application of solar cells for solar energy. The term "photovoltaic" comes from the Greek φώς (phos) meaning "light," and "voltaic," meaning electric, from the name of the Italian physicist Volta, after whom a unit of electrical potential, the volt, is named. The term "photo-voltaic" has been in use in English since 1849. The photovoltaic effect was first recognized in 1839 by French physicist A. E. Becquerel. However, it was not until 1883 that the first solar cell was built, by Charles Fritts, who coated the semiconductor selenium with an extremely thin layer of gold to form the junctions. The device was only around 1 percent efficient. Sven Ason Berglund had a number of patents concerning methods of increasing the capacity of these cells. Russell Ohl patented the modern junction semiconductor solar cell in 1946 (U.S. Patent 2402662 (PDF), "Light sensitive device"), which was discovered while working on the series of advances that would lead to the transistor. The modern age of solar power technology arrived in 1954 when Bell Laboratories, experimenting with semiconductors, accidentally found that silicon doped with certain impurities was very sensitive to light. This resulted in the production of the first practical solar cells with a sunlight energy conversion efficiency of around 6 percent. The first spacecraft to use solar panels was the US satellite Vanguard 1, launched in March 1958 with solar cells made by Hoffman Electronics. This milestone created interest in producing and launching a geostationary communications satellite, in which solar energy would provide a viable power supply. This was a crucial development which stimulated funding from several governments into research for improved solar cells. In 1970 the first highly effective GaAs heterostructure solar cells were created by Zhores Alferov and his team in the USSR. Metal Organic Chemical Vapor Deposition (MOCVD, or OMCVD) production equipment was not developed until the early 1980s, limiting the ability of companies to manufacture the GaAs solar cell. In the United States, the first 17 percent efficient air mass zero (AM0) single-junction GaAs solar cells were manufactured in production quantities in 1988 by Applied Solar Energy Corporation (ASEC). The "dual junction" cell was accidentally produced in quantity by ASEC in 1989 as a result of the change from GaAs on GaAs substrates to GaAs on Germanium (Ge) substrates. The accidental doping of Ge with the GaAs buffer layer created higher open circuit voltages, demonstrating the potential of using the Ge substrate as another cell. As GaAs single-junction cells topped 19 percent AM0 production efficiency in 1993, ASEC developed the first dual junction cells for spacecraft use in the United States, with a starting efficiency of approximately 20 percent. These cells did not utilize the Ge as a second cell, but used another GaAs-based cell with different doping. Eventually GaAs dual junction cells reached production efficiencies of about 22 percent. Triple Junction solar cells began with AM0 efficiencies of approximately 24 percent in 2000, 26 percent in 2002, 28 percent in 2005, and in 2007 have evolved to a 30 percent AM0 production efficiency, currently in qualification. 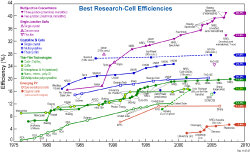 Recent world record claims of efficiency for multiple junction solar cells are discussed in the Records section. Solar Cells are classified into three generations which indicates the order of which each became important. At present there is concurrent research into all three generations while the first generation technologies are most highly represented in commercial production, accounting for 89.6 percent of 2007 production. First generation cells consist of large-area, high quality and single junction devices. First Generation technologies involve high energy and labor inputs which prevent any significant progress in reducing production costs. Single junction silicon devices are approaching the theoretical limiting efficiency of 33 percent and achieve cost parity with fossil fuel energy generation after a payback period of 5-7 years. They are not likely to get lower than US$1/W. Second generation materials have been developed to address energy requirements and production costs of solar cells. Alternative manufacturing techniques such as vapor deposition, electroplating, and use of Ultrasonic Nozzles are advantageous as they reduce high temperature processing significantly. It is commonly accepted that as manufacturing techniques evolve production costs will be dominated by constituent material requirements, whether this be a silicon substrate, or glass cover. Second generation technologies are expected to gain market share in 2008. Such processes can bring costs down to a little under US$0.50/W but because of the defects inherent in the lower quality processing methods, have much reduced efficiencies compared to First Generation. The most successful second generation materials have been cadmium telluride (CdTe), copper indium gallium selenide, amorphous silicon and micromorphous silicon. These materials are applied in a thin film to a supporting substrate such as glass or ceramics reducing material mass and therefore costs. These technologies do hold promise of higher conversion efficiencies, particularly CIGS-CIS, DSC and CdTe offers significantly cheaper production costs. Among major manufacturers there is certainly a trend toward second generation technologies however commercialization of these technologies has proven difficult. In 2007 First Solar produced 200 MW of CdTe solar cells making it the fifth largest producer of solar cells in 2007 and the first ever to reach the top ten from production of second generation technologies alone. Honda Soltec Co., Ltd., a Honda company, also began to commercialize] their CIGS base solar panel in 2008. In 2007 CdTe production represented 4.7 percent of total market share, thin-film silicon 5.2 percent and CIGS 0.5 percent. Current research is targeting conversion efficiencies of 30-60 percent while retaining low cost materials and manufacturing techniques. They can exceed the theoretical solar conversion efficiency limit for a single energy threshold material, that was calculated in 1961 by Shockley and Queisser as 31 percent under 1 sun illumination and 40.8 percent under maximal concentration of sunlight (46,200 suns, which makes the latter limit more difficult to approach than the former). Multijunction photovoltaic cell (multiple energy threshold devices). High efficiency solar cells are a class of solar cells that can generate electricity at higher efficiencies than conventional solar cells. While high efficiency solar cells are more efficient in terms of electrical output per incident energy (watt/watt), much of the industry is focused on the most cost efficient technologies (cost-per-watt or $/watt). Still, many businesses and academics are focused on increasing the electrical efficiency of cells, and much development is focused on high efficiency solar cells. In 1994, the University of New South Wales (UNSW) reported the highest silicon solar cell efficiency of 24.7 percent with their PERL cell technology. This record was valid until 2008. UNSW's ARC Photovoltaic Centre of Excellence reported the first silicon solar cell to achieve the milestone of 25 per cent efficiency. The record for multiple junction solar cells is disputed. A team lead by the University of Delaware, the Fraunhofer Institute, and NREL all claim the world record title at 42.8, 41.1, and 40.8 percent, respectively. NREL claims that the other implementations have never been put under any standardized tests and, in the case of the University of Delaware project, represents only hypothetical efficiencies of a panel that's never been fully assembled. In 2002, the highest reported efficiency for solar cells based on thin films of CdTe is 18 percent, which was achieved by the research group of prof. I.M.Dharmadasa at Sheffield Hallam University in the United Kingdom. The US national renewable energy research facility NREL achieved an efficiency of 19.9 percent for the solar cells based on copper indium gallium selenide thin films, also known as CIGS. These CIGS films have been grown by physical vapor deposition in a three-stage co-evaporation process. In this process In, Ga and Se are evaporated in the first step; in the second step it is followed by Cu and Se co-evaporation and in the last step terminated by In, Ga and Se evaporation again. Solar cells are often electrically connected and encapsulated as a module. PV modules often have a sheet of glass on the front (sun up) side, allowing light to pass while protecting the semiconductor wafers from the elements (rain, hail, etc.). Solar cells are also usually connected in series in modules, creating an additive voltage. Connecting cells in parallel will yield a higher current. Modules are then interconnected, in series or parallel, or both, to create an array with the desired peak DC voltage and current. Photons in sunlight hit the solar panel and are absorbed by semiconducting materials, such as silicon. Electrons (negatively charged) are knocked loose from their atoms, allowing them to flow through the material to produce electricity. Due to the special composition of solar cells, the electrons are only allowed to move in a single direction. The complementary positive charges that are also created (like bubbles) are called holes and flow in the direction opposite of the electrons in a silicon solar panel. An array of solar cells converts solar energy into a usable amount of direct current (DC) electricity. the photon can be absorbed by the silicon, if the photon energy is higher than the silicon band gap value. This generates an electron-hole pair and sometimes heat, depending on the band structure. When a photon is absorbed, its energy is given to an electron in the crystal lattice. Usually this electron is in the valence band, and is tightly bound in covalent bonds between neighboring atoms, and hence unable to move far. The energy given to it by the photon "excites" it into the conduction band, where it is free to move around within the semiconductor. The covalent bond that the electron was previously a part of now has one fewer electron—this is known as a hole. The presence of a missing covalent bond allows the bonded electrons of neighboring atoms to move into the "hole," leaving another hole behind, and in this way a hole can move through the lattice. Thus, it can be said that photons absorbed in the semiconductor create mobile electron-hole pairs. A photon need only have greater energy than that of the band gap in order to excite an electron from the valence band into the conduction band. However, the solar frequency spectrum approximates a black body spectrum at ~6000 K, and as such, much of the solar radiation reaching the Earth is composed of photons with energies greater than the band gap of silicon. These higher energy photons will be absorbed by the solar cell, but the difference in energy between these photons and the silicon band gap is converted into heat (via lattice vibrations—called phonons) rather than into usable electrical energy. diffusion of carriers from zones of high carrier concentration to zones of low carrier concentration (following a gradient of electrochemical potential). In the widely used p-n junction solar cells, the dominant mode of charge carrier separation is by drift. However, in non-p-n-junction solar cells (typical of the third generation solar cell research such as dye and polymer solar cells), a general electrostatic field has been confirmed to be absent, and the dominant mode of separation is via charge carrier diffusion. The most commonly known solar cell is configured as a large-area p-n junction made from silicon. As a simplification, one can imagine bringing a layer of n-type silicon into direct contact with a layer of p-type silicon. In practice, p-n junctions of silicon solar cells are not made in this way, but rather, by diffusing an n-type dopant into one side of a p-type wafer (or vice versa). If a piece of p-type silicon is placed in intimate contact with a piece of n-type silicon, then a diffusion of electrons occurs from the region of high electron concentration (the n-type side of the junction) into the region of low electron concentration (p-type side of the junction). When the electrons diffuse across the p-n junction, they recombine with holes on the p-type side. The diffusion of carriers does not happen indefinitely however, because of an electric field which is created by the imbalance of charge immediately on either side of the junction which this diffusion creates. The electric field established across the p-n junction creates a diode that promotes current in only one direction across the junction. Electrons may pass from the n-type side into the p-type side, and holes may pass from the p-type side to the n-type side, but not the other way around. This region where electrons have diffused across the junction is called the depletion region because it no longer contains any mobile charge carriers. It is also known as the "space charge region." Ohmic metal-semiconductor contacts are made to both the n-type and p-type sides of the solar cell, and the electrodes connected to an external load. Electrons that are created on the n-type side, or have been "collected" by the junction and swept onto the n-type side, may travel through the wire, power the load, and continue through the wire until they reach the p-type semiconductor-metal contact. Here, they recombine with a hole that was either created as an electron-hole pair on the p-type side of the solar cell, or are swept across the junction from the n-type side after being created there. The voltage measured is equal to the difference in the quasi Fermi levels of the minority carriers, i.e., electrons in the p-type portion, and holes in the n-type portion. To understand the electronic behavior of a solar cell, it is useful to create a model which is electrically equivalent, and is based on discrete electrical components whose behavior is well known. An ideal solar cell may be modeled by a current source in parallel with a diode; in practice no solar cell is ideal, so a shunt resistance and a series resistance component are added to the model. The resulting equivalent circuit of a solar cell is shown on the left. Also shown, on the right, is the schematic representation of a solar cell for use in circuit diagrams. For silicon at 25°C, volts. An alternative derivation produces an equation similar in appearance, but with on the left-hand side. The two alternatives are identities; that is, they yield precisely the same results. Since the parameters , , , and cannot be measured directly, the most common application of the characteristic equation is nonlinear regression to extract the values of these parameters on the basis of their combined effect on solar cell behavior. A practical limitation of this formulation is that as cell sizes shrink, certain parasitic effects grow in importance and can affect the extracted parameter values. For example, recombination and contamination of the junction tend to be greatest at the perimeter of the cell, so very small cells may exhibit higher values of or lower values of than larger cells that are otherwise identical. In such cases, comparisons between cells must be made cautiously and with these effects in mind. Temperature affects the characteristic equation in two ways: directly, via in the exponential term, and indirectly via its effect on . (Strictly speaking, temperature affects all of the terms, but these two far more significantly than the others.) While increasing reduces the magnitude of the exponent in the characteristic equation, the value of increases in proportion to . The net effect is to reduce linearly with increasing temperature. The magnitude of this reduction is inversely proportional to ; that is, cells with higher values of suffer smaller reductions in voltage with increasing temperature. For most crystalline silicon solar cells the reduction is about 0.50%/°C, though the rate for the highest-efficiency crystalline silicon cells is around 0.35%/°C. By way of comparison, the rate for amorphous silicon solar cells is 0.20-0.30%/°C, depending on how the cell is made. The amount of photogenerated current increases slightly with increasing temperature because of an increase in the number of thermally generated carriers in the cell. This effect is slight, however: about 0.065%/°C for crystalline silicon cells and 0.09 percent for amorphous silicon cells. As series resistance increases, the voltage drop between the junction voltage and the terminal voltage becomes greater for the same flow of current. The result is that the current-controlled portion of the I-V curve begins to sag toward the origin, producing a significant decrease in the terminal voltage and a slight reduction in . Very high values of will also produce a significant reduction in ; in these regimes, series resistance dominates and the behavior of the solar cell resembles that of a resistor. These effects are shown for crystalline silicon solar cells in the I-V curves displayed in the figure to the right. As shunt resistance decreases, the flow of current diverted through the shunt resistor increases for a given level of junction voltage. The result is that the voltage-controlled portion of the I-V curve begins to sag toward the origin, producing a significant decrease in the terminal current and a slight reduction in . Very low values of will produce a significant reduction in . Much as in the case of a high series resistance, a badly shunted solar cell will take on operating characteristics similar to those of a resistor. These effects are shown for crystalline silicon solar cells in the I-V curves displayed in the figure to the right. Thus, an increase in produces a reduction in proportional to the inverse of the logarithm of the increase. This explains mathematically the reason for the reduction in that accompanies increases in temperature described above. The effect of reverse saturation current on the I-V curve of a crystalline silicon solar cell are shown in the figure to the right. Physically, reverse saturation current is a measure of the "leakage" of carriers across the p-n junction in reverse bias. This leakage is a result of carrier recombination in the neutral regions on either side of the junction. The ideality factor (also called the emissivity factor) is a fitting parameter that describes how closely the diode's behavior matches that predicted by theory, which assumes the p-n junction of the diode is an infinite plane and no recombination occurs within the space-charge region. A perfect match to theory is indicated when . When recombination in the space-charge region dominate other recombination, however, . 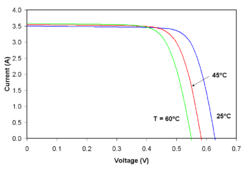 The effect of changing ideality factor independently of all other parameters is shown for a crystalline silicon solar cell in the I-V curves displayed in the figure to the right. Most solar cells, which are quite large compared to conventional diodes, well approximate an infinite plane and will usually exhibit near-ideal behavior under Standard Test Condition ( ). Under certain operating conditions, however, device operation may be dominated by recombination in the space-charge region. This is characterized by a significant increase in as well as an increase in ideality factor to . The latter tends to erode solar cell output voltage while the former acts to increase it. The net effect, therefore, is a combination of the increase in voltage shown for increasing in the figure to the right and the decrease in voltage shown for increasing in the figure above. Typically, is the more significant factor and the result is a reduction in voltage. A solar cell's energy conversion efficiency ( , "eta"), is the percentage of power converted (from absorbed light to electrical energy) and collected, when a solar cell is connected to an electrical circuit. This term is calculated using the ratio of the maximum power point, Pm, divided by the input light irradiance (E, in W/m2) under standard test conditions (STC) and the surface area of the solar cell (Ac in m2). STC specifies a temperature of 25°C and an irradiance of 1000 W/m2 with an air mass 1.5 (AM1.5) spectrum. These correspond to the irradiance and spectrum of sunlight incident on a clear day upon a sun-facing 37°-tilted surface with the sun at an angle of 41.81° above the horizon. This condition approximately represents solar noon near the spring and autumn equinoxes in the continental United States with surface of the cell aimed directly at the sun. Thus, under these conditions a solar cell of 12 percent efficiency with a 100 cm2 (0.01 m2) surface area can be expected to produce approximately 1.2 watts of power. Due to the difficulty in measuring these parameters directly, other parameters are measured instead: Thermodynamic Efficiency, Quantum Efficiency, VOC ratio, and Fill Factor. Reflectance losses are a portion of the Quantum Efficiency under "External Quantum Efficiency." Recombination losses make up a portion of the Quantum Efficiency, VOC ratio, and Fill Factor. Resistive losses are predominantly categorized under Fill Factor, but also make up minor portions of the Quantum Efficiency, VOC ratio. Generally, solar cells on the market today do not produce much electricity from ultraviolet light, instead it is either filtered out or absorbed by the cell, heating the cell. That heat is wasted energy and could even lead to damage to the cell. Solar cells operate as quantum energy conversion devices, and are therefore subject to the "Thermodynamic Efficiency Limit." Photons with an energy below the band gap of the absorber material cannot generate a hole-electron pair, and so their energy is not converted to useful output and only generates heat if absorbed. For photons with an energy above the band gap energy, only a fraction of the energy above the band gap can be converted to useful output. When a photon of greater energy is absorbed, the excess energy above the band gap is converted to kinetic energy of the carrier combination. The excess kinetic energy is converted to heat through phonon interactions as the kinetic energy of the carriers slows to equilibrium velocity. As described above, when a photon is absorbed by a solar cell it can produce a pair of free charge carriers, i.e., an electron-hole pair. One of the carriers (the minority carrier) may then be able to reach the p-n junction and contribute to the current produced by the solar cell; such a carrier is said to be collected. Alternatively, the carrier may give up its energy and once again become bound to an atom within the solar cell without being collected; this process is then called recombination since one electron and one hole recombine and thereby annihilate the associated free charge. The carriers that recombine do not contribute to the generation of electrical current. Quantum efficiency refers to the percentage of photons that are converted to electric current (i.e., collected carriers) when the cell is operated under short circuit conditions. External quantum efficiency (EQE) is the fraction of incident photons that are converted to electrical current, while internal quantum efficiency (IQE) is the fraction of absorbed photons that are converted to electrical current. Mathematically, internal quantum efficiency is related to external quantum efficiency by the reflectance (R) and the transmittance (T) of the solar cell by . Please note that for a thick bulk Si solar cell T is approximately zero and is therefore in practical cases often neglected. Quantum efficiency should not be confused with energy conversion efficiency, as it does not convey information about the fraction of power that is converted by the solar cell. Furthermore, quantum efficiency is most usefully expressed as a spectral measurement (that is, as a function of photon wavelength or energy). Since some wavelengths are absorbed more effectively than others in most semiconductors, spectral measurements of quantum efficiency can yield valuable information about which parts of a particular solar cell design are most in need of improvement. Spectral quantum efficiency measurements also allow determining important solar cell parameters such as the base diffusion length. A high quality, monocrystalline silicon solar cell, at 25 °C cell temperature, may produce 0.60 volts open-circuit (Voc). The cell temperature in full sunlight, even with 25 °C air temperature, will probably be close to 45 °C, reducing the open-circuit voltage to 0.55 volts per cell. The voltage drops modestly, with this type of cell, until the short-circuit current is approached (Isc). Maximum power (with 45 °C cell temperature) is typically produced with 75 percent to 80 percent of the open-circuit voltage (0.43 volts in this case) and 90 percent of the short-circuit current. This output can be up to 70 percent of the Voc x Isc product. The short-circuit current (Isc) from a cell is nearly proportional to the illumination, while the open-circuit voltage (Voc) may drop only 10 percent with a 80 percent drop in illumination. Lower-quality cells have a more rapid drop in voltage with increasing current and could produce only 1/2 Voc at 1/2 Isc. The usable power output could thus drop from 70 percent of the Voc x Isc product to 50 percent or even as little as 25 percent. Vendors who rate their solar cell "power" only as Voc x Isc, without giving load curves, can be seriously distorting their actual performance. At this point, discussion of the different ways to calculate efficiency for space cells and terrestrial cells is necessary to alleviate confusion. In space, where there is no atmosphere, the spectrum of the sun is relatively unfiltered. However, on earth, with air filtering the incoming light, the solar spectrum changes. To account for the spectral differences, a system was devised to calculate this filtering effect. Simply, the filtering effect ranges from Air Mass 0 (AM0) in space, to approximately Air Mass 1.5 on earth. Multiplying the spectral differences by the quantum efficiency of the solar cell in question will yield the efficiency of the device. For example, a Silicon solar cell in space might have an efficiency of 14 percent at AM0, but have an efficiency of 16 percent on earth at AM 1.5. Terrestrial efficiencies typically are greater than space efficiencies. Solar cell efficiencies vary from 6 percent for amorphous silicon-based solar cells to 40.7 percent with multiple-junction research lab cells and 42.8 percent with multiple dies assembled into a hybrid package. Solar cell energy conversion efficiencies for commercially available multicrystalline Si solar cells are around 14-19 percent. The highest efficiency cells have not always been the most economical—for example a 30 percent efficient multijunction cell based on exotic materials such as gallium arsenide or indium selenide and produced in low volume might well cost one hundred times as much as an 8% efficient amorphous silicon cell in mass production, while only delivering about four times the electrical power. However, there is a way to "boost" solar power. By increasing the light intensity, typically photogenerated carriers are increased, resulting in increased efficiency by up to 15 percent. These so-called "concentrator systems" have only begun to become cost-competitive as a result of the development of high efficiency GaAs cells. The increase in intensity is typically accomplished by using concentrating optics. A typical concentrator system may use a light intensity 6-400 times the sun, and increase the efficiency of a one sun GaAs cell from 31 percent at AM 1.5 to 35 percent. See Concentrating photovoltaics (CPV) below and Concentrating solar power (CSP). Since solar cell output power depends on multiple factors, such as the sun's incidence angle, for comparison purposes between different cells and panels, the measure of watts peak (Wp) is used. It is the output power under these conditions known as STC. Larger panels use the same rating system, but use kWp (1000 watts peak). Energy payback is the recovery (period) of the energy spent for manufacturing of the respective technical energy systems, also called harvesting ratio (ISO 13602). In the 1990s, when silicon cells were twice as thick, efficiencies were 30 percent lower than today and lifetimes were shorter, it may well have cost more energy to make a cell than it could generate in a lifetime. In the meantime, the technology has progressed significantly, and the energy payback time of a modern photovoltaic module is typically from 1 to 4 years depending on the type and where it is used (see net energy gain). Generally, thin film technologies - despite having comparatively low conversion efficiencies - achieve significantly shorter energy payback times than conventional systems (often < 1 year). With a typical lifetime of 20 to 30 years, this means that modern solar cells are net energy producers, i.e., they generate significantly more energy over their lifetime than the energy expended in producing them. All solar cells require a light absorbing material contained within the cell structure to absorb photons and generate electrons via the photoelectric effect. The materials used in solar cells tend to have the property of preferentially absorbing the wavelengths of solar light that reach the earth surface; however, some solar cells are optimized for light absorption beyond Earth's atmosphere as well. Light absorbing materials can often be used in multiple physical configurations to take advantage of different light absorption and charge separation mechanisms. Many currently available solar cells are configured as bulk materials that are subsequently cut into wafers and treated in a "top-down" method of synthesis (silicon being the most prevalent bulk material). Other materials are configured as thin-films (inorganic layers, organic dyes, and organic polymers) that are deposited on supporting substrates, while a third group are configured as nanocrystals and used as quantum dots (electron-confined nanoparticles) embedded in a supporting matrix in a "bottom-up" approach. Silicon remains the only material that is well-researched in both bulk (also called wafer-based) and thin-film configurations. There are many new alternatives to Silicon photocells. Proprietary nanoparticle silicon printing processes promises many of the photovoltaic features that conventional silicon can never achieve. It can be printed reel-to-reel on stainless steel or other high temperature substrates. However, most of the work on the next generation of photovoltaics is directed at printing onto low cost flexible polymer film and ultimately on common packaging materials. The main contenders are currently CIGS, CdTe, DSSC and organic photovoltaics. These bulk technologies are often referred to as wafer-based manufacturing. In other words, in each of these approaches, self-supporting wafers between 180 to 240 micrometers thick are processed and then soldered together to form a solar cell module. A general description of silicon wafer processing is provided in Manufacture and Devices. Basic structure of a silicon based solar cell and its working mechanism. By far, the most prevalent bulk material for solar cells is crystalline silicon (abbreviated as a group as c-Si), also known as "solar grade silicon." Bulk silicon is separated into multiple categories according to crystallinity and crystal size in the resulting ingot, ribbon, or wafer. monocrystalline silicon (c-Si): often made using the Czochralski process. Single-crystal wafer cells tend to be expensive, and because they are cut from cylindrical ingots, do not completely cover a square solar cell module without a substantial waste of refined silicon. Hence most c-Si panels have uncovered gaps at the four corners of the cells. Ribbon silicon is a type of monocrystalline silicon: it is formed by drawing flat thin films from molten silicon and having a multicrystalline structure. These cells have lower efficiencies than poly-Si, but save on production costs due to a great reduction in silicon waste, as this approach does not require sawing from ingots. Poly- or multicrystalline silicon (poly-Si or mc-Si): made from cast square ingots—large blocks of molten silicon carefully cooled and solidified. Poly-Si cells are less expensive to produce than single crystal silicon cells, but are less efficient. US DOE data shows that there were a higher number of multicrystalline sales than monocrystalline silicon sales. The various thin-film technologies currently being developed reduce the amount (or mass) of light absorbing material required in creating a solar cell. This can lead to reduced processing costs from that of bulk materials (in the case of silicon thin films) but also tends to reduce energy conversion efficiency (an average 7 to 10% efficiency), although many multi-layer thin films have efficiencies above those of bulk silicon wafers. They have become popular compared to wafer silicon due to lower costs and advantages including flexibility, lighter weights, and ease of integration. A cadmium telluride solar cell is a solar cell based on cadmium telluride, an efficient light-absorbing material for thin-film cells. Compared to other thin-film materials, CdTe is easier to deposit and more suitable for large-scale production. The materials based on CuInSe2 that are of interest for photovoltaic applications include several elements from groups I, III and VI in the periodic table. These semiconductors are especially attractive for thin film solar cell application because of their high optical absorption coefficients and versatile optical and electrical characteristics which can in principle be manipulated and tuned for a specific need in a given device. CIS is an abbreviation for general chalcopyrite films of copper indium selenide (CuInSe2), CIGS mentioned below is a variation of CIS. CIS films (no Ga) achieved greater than 14 percent efficiency. However, manufacturing costs of CIS solar cells at present are high when compared with amorphous silicon solar cells but continuing work is leading to more cost-effective production processes. The first large-scale production of CIS modules was started in 2006 in Germany by Wuerth Solar. When gallium is substituted for some of the indium in CIS, the material is referred to as CIGS, or copper indium/gallium diselenide, a solid mixture of the semiconductors CuInSe2 and CuGaSe2, often abbreviated by the chemical formula CuInxGa(1-x)Se2. Unlike the conventional silicon based solar cell, which can be modeled as a simple p-n junction (see under semiconductor), these cells are best described by a more complex heterojunction model. Higher efficiencies (around 30 percent) can be obtained by using optics to concentrate the incident light or by using multi-junction tandem solar cells. The use of gallium increases the optical bandgap of the CIGS layer as compared to pure CIS, thus increasing the open-circuit voltage, but decreasing the short circuit current. In another point of view, gallium is added to replace indium due to gallium's relative availability to indium. Approximately 70 percent of indium currently produced is used by the flat-screen monitor industry. However, the atomic ratio for Ga in the >19 percent efficient CIGS solar cells is ~7 percent, which corresponds to a bandgap of ~1.15 eV. CIGS solar cells with higher Ga amounts have lower efficiency. For example, CGS solar cells (which have a bandgap of ~1.7eV have a record efficiency of 9.5 percent for pure CGS and 10.2 percent for surface-modified CGS. Some investors in solar technology worry that production of CIGS cells will be limited by the availability of indium. Producing 2 GW of CIGS cells (roughly the amount of silicon cells produced in 2006) would use about 10 percent of the indium produced in 2004. For comparison, silicon solar cells used up 33 percent of the world's electronic grade silicon production in 2006. Nanosolar claims to waste only 5 percent of the indium it uses. As of 2006, the best conversion efficiency for flexible CIGS cells on polyimide is 14.1 percent by Tiwari et al, at the ETH, Switzerland. Comparable efficiencies have been reported on other flexible substrates. That being said, indium can easily be recycled from decommissioned PV modules. The recycling program in Germany is an example that highlights the regenerative industrial paradigm: "From cradle to cradle." High-efficiency multijunction cells were originally developed for special applications such as satellites and space exploration, but at present, their use in terrestrial concentrators might be the lowest cost alternative in terms of $/kWh and $/W. These multijunction cells consist of multiple thin films produced using Metalorganic vapor phase epitaxy. A triple-junction cell, for example, may consist of the semiconductors: GaAs, Ge, and GaInP2. Each type of semiconductor will have a characteristic band gap energy which, loosely speaking, causes it to absorb light most efficiently at a certain color, or more precisely, to absorb electromagnetic radiation over a portion of the spectrum. The semiconductors are carefully chosen to absorb nearly all of the solar spectrum, thus generating electricity from as much of the solar energy as possible. This technology was utilized in the Mars Rover missions. Tandem solar cells based on monolithic, series connected, gallium indium phosphide (GaInP), gallium arsenide GaAs, and germanium Ge pn junctions, are seeing demand rapidly rise. In just the past 12 months (12/2006 - 12/2007), the cost of 4N gallium metal has risen from about $350 per kg to $680 per kg. Additionally, germanium metal prices have risen substantially to $1000-$1200 per kg this year. Those materials include gallium (4N, 6N and 7N Ga), arsenic (4N, 6N and 7N) and germanium, pyrolitic boron nitride (pBN) crucibles for growing crystals, and boron oxide, these products are critical to the entire substrate manufacturing industry. Typically a ruthenium metalorganic dye (Ru-centered) is used as a monolayer of light-absorbing material. The dye-sensitized solar cell depends on a mesoporous layer of nanoparticulate titanium dioxide to greatly amplify the surface area (200-300 m2/g TiO2, as compared to approximately 10 m2/g of flat single crystal). The photogenerated electrons from the light absorbing dye are passed on to the n-type TiO2, and the holes are passed to an electrolyte on the other side of the dye. The circuit is completed by a redox couple in the electrolyte, which can be liquid or solid. This type of cell allows a more flexible use of materials, and is typically manufactured by screen printing, with the potential for lower processing costs than those used for bulk solar cells. However, the dyes in these cells also suffer from degradation under heat and UV light, and the cell casing is difficult to seal due to the solvents used in assembly. In spite of the above, this is a popular emerging technology with some commercial impact forecast within this decade. Organic solar cells and Polymer solar cells are built from thin films (typically 100 nm) of organic semiconductors such as polymers and small-molecule compounds like polyphenylene vinylene, copper phthalocyanine (a blue or green organic pigment) and carbon fullerenes and fullerene derivatives such as PCBM. Energy conversion efficiencies achieved to date using conductive polymers are low compared to inorganic materials, with the highest reported efficiency of 6.5 percent for a tandem cell architecture. However, these cells could be beneficial for some applications where mechanical flexibility and disposability are important. These devices differ from inorganic semiconductor solar cells in that they do not rely on the large built-in electric field of a PN junction to separate the electrons and holes created when photons are absorbed. The active region of an organic device consists of two materials, one which acts as an electron donor and the other as an acceptor. When a photon is converted into an electron hole pair, typically in the donor material, the charges tend to remain bound in the form of an exciton, and are separated when the exciton diffuses to the donor-acceptor interface. The short exciton diffusion lengths of most polymer systems tend to limit the efficiency of such devices. Nanostructured interfaces, sometimes in the form of bulk heterojunctions, can improve performance. These types of silicon present dangling and twisted bonds, which results in deep defects (energy levels in the bandgap) as well as deformation of the valence and conduction bands (band tails). The solar cells made from these materials tend to have lower energy conversion efficiency than bulk silicon, but are also less expensive to produce. The quantum efficiency of thin film solar cells is also lower due to reduced number of collected charge carriers per incident photon. Amorphous silicon has a higher bandgap (1.7 eV) than crystalline silicon (c-Si) (1.1 eV), which means it absorbs the visible part of the solar spectrum more strongly than the infrared portion of the spectrum. As nc-Si has about the same bandgap as c-Si, the nc-Si and a-Si can advantageously be combined in thin layers, creating a layered cell called a tandem cell. The top cell in a-Si absorbs the visible light and leaves the infrared part of the spectrum for the bottom cell in nanocrystalline Si. Recently, solutions to overcome the limitations of thin-film crystalline silicon have been developed. Light trapping schemes where the weakly absorbed long wavelength light is obliquely coupled into the silicon and traverses the film several times can significantly enhance the absorption of sunlight in the thin silicon films. Thermal processing techniques can significantly enhance the crystal quality of the silicon and thereby lead to higher efficiencies of the final solar cells. A silicon thin film technology is being developed for building integrated photovoltaics (BIPV) in the form of semi-transparent solar cells which can be applied as window glazing. These cells function as window tinting while generating electricity. These structures make use of some of the same thin-film light absorbing materials but are overlain as an extremely thin absorber on a supporting matrix of conductive polymer or mesoporous metal oxide having a very high surface area to increase internal reflections (and hence increase the probability of light absorption). Using nanocrystals allows one to design architectures on the length scale of nanometers, the typical exciton diffusion length. In particular, single-nanocrystal ('channel') devices, an array of single p-n junctions between the electrodes and separated by a period of about a diffusion length, represent a new architecture for solar cells and potentially high efficiency. Concentrating photovoltaic systems use a large area of lenses or mirrors to focus sunlight on a small area of photovoltaic cells. If these systems use single or dual-axis tracking to improve performance, they may be referred to as Heliostat Concentrator Photovoltaics (HCPV). The primary attraction of CPV systems is their reduced usage of semiconducting material which is expensive and currently in short supply. Additionally, increasing the concentration ratio improves the performance of general photovoltaic materials. Despite the advantages of CPV technologies their application has been limited by the costs of focusing, tracking and cooling equipment. On October 25, 2006, the Australian federal government and the Victorian state government together with photovoltaic technology company Solar Systems announced a project using this technology, Solar power station in Victoria, planned to come online in 2008 and be completed by 2013. Because solar cells are semiconductor devices, they share many of the same processing and manufacturing techniques as other semiconductor devices such as computer and memory chips. However, the stringent requirements for cleanliness and quality control of semiconductor fabrication are a little more relaxed for solar cells. Most large-scale commercial solar cell factories today make screen printed poly-crystalline silicon solar cells. Single crystalline wafers which are used in the semiconductor industry can be made into excellent high efficiency solar cells, but they are generally considered to be too expensive for large-scale mass production. Poly-crystalline silicon wafers are made by wire-sawing block-cast silicon ingots into very thin (180 to 350 micrometer) slices or wafers. The wafers are usually lightly p-type doped. To make a solar cell from the wafer, a surface diffusion of n-type dopants is performed on the front side of the wafer. This forms a p-n junction a few hundred nanometers below the surface. Antireflection coatings, which increase the amount of light coupled into the solar cell, are typically next applied. Over the past decade, silicon nitride has gradually replaced titanium dioxide as the antireflection coating of choice because of its excellent surface passivation qualities (i.e., it prevents carrier recombination at the surface of the solar cell). It is typically applied in a layer several hundred nanometers thick using plasma-enhanced chemical vapor deposition (PECVD). Some solar cells have textured front surfaces that, like antireflection coatings, serve to increase the amount of light coupled into the cell. Such surfaces can usually only be formed on single-crystal silicon, though in recent years methods of forming them on multicrystalline silicon have been developed. The wafer then has a full area metal contact made on the back surface, and a grid-like metal contact made up of fine "fingers" and larger "busbars" are screen-printed onto the front surface using a silver paste. The rear contact is also formed by screen-printing a metal paste, typically aluminum. Usually this contact covers the entire rear side of the cell, though in some cell designs it is printed in a grid pattern. The paste is then fired at several hundred degrees Celsius to form metal electrodes in ohmic contact with the silicon. 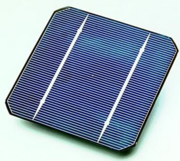 After the metal contacts are made, the solar cells are interconnected in series (and/or parallel) by flat wires or metal ribbons, and assembled into modules or "solar panels." Solar panels have a sheet of tempered glass on the front, and a polymer encapsulation on the back. Tempered glass cannot be used with amorphous silicon cells because of the high temperatures during the deposition process. Most commercially available solar cells are capable of producing electricity for at least twenty years without a significant decrease in efficiency. Cost is established in cost-per-watt and in cost-per-watt in 24 hours for infrared capable photovoltaic cells. University of Utah engineers devised a new way to slice thin wafers of the chemical element germanium for use in the most efficient type of solar power cells. The new method should lower the cost of such cells by reducing the waste and breakage of the brittle semiconductor. Dye-sensitized solar cell is considered the low-cost solar cell. This cell is extremely promising because it is made of low-cost materials and does not need elaborate apparatus to manufacture, so it can be made in a DIY way allowing more players to produce it than any other type of solar cell. In bulk it should be significantly less expensive than older solid-state cell designs. It can be engineered into flexible sheets. Although its conversion efficiency is less than the best thin film cells, its price/performance ratio should be high enough to allow them to compete with fossil fuel electrical generation. There are currently many research groups active in the field of photovoltaics in universities and research institutions around the world. This research can be divided into three areas: making current technology solar cells cheaper and/or more efficient to effectively compete with other energy sources; developing new technologies based on new solar cell architectural designs; and developing new materials to serve as light absorbers and charge carriers. One way of reducing the cost is to develop cheaper methods of obtaining silicon that is sufficiently pure. Silicon is a very common element, but is normally bound in silica, or silica sand. Processing silica (SiO2) to produce silicon is a very high energy process - at current efficiencies, it takes over two years for a conventional solar cell to generate as much energy as was used to make the silicon it contains. More energy efficient methods of synthesis are not only beneficial to the solar industry, but also to industries surrounding silicon technology as a whole. The current industrial production of silicon is via the reaction between carbon (charcoal) and silica at a temperature around 1700 degrees Celsius. In this process, known as carbothermic reduction, each tonne of silicon (metallurgical grade, about 98 percent pure) is produced with the emission of about 1.5 tonnes of carbon dioxide. Solid silica can be directly converted (reduced) to pure silicon by electrolysis in a molten salt bath at a fairly mild temperature (800 to 900 degrees Celsius). While this new process is in principle the same as the FFC Cambridge Process which was first discovered in late 1996, the interesting laboratory finding is that such electrolytic silicon is in the form of porous silicon which turns readily into a fine powder, (with a particle size of a few micrometers), and may therefore offer new opportunities for development of solar cell technologies. Another approach is also to reduce the amount of silicon used and thus cost, is by micromachining wafers into very thin, virtually transparent layers that could be used as transparent architectural coverings. The technique involves taking a silicon wafer, typically 1 to 2 mm thick, and making a multitude of parallel, transverse slices across the wafer, creating a large number of slivers that have a thickness of 50 micrometers and a width equal to the thickness of the original wafer. These slices are rotated 90 degrees, so that the surfaces corresponding to the faces of the original wafer become the edges of the slivers. The result is to convert, for example, a 150 mm diameter, 2 mm-thick wafer having an exposed silicon surface area of about 175 cm2 per side into about 1000 slivers having dimensions of 100 mm × 2 mm × 0.1 mm, yielding a total exposed silicon surface area of about 2000 cm2 per side. As a result of this rotation, the electrical doping and contacts that were on the face of the wafer are located the edges of the sliver, rather than the front and rear as is the case with conventional wafer cells. This has the interesting effect of making the cell sensitive from both the front and rear of the cell (a property known as bifaciality). Using this technique, one silicon wafer is enough to build a 140 watt panel, compared to about 60 wafers needed for conventional modules of same power output. Thin-film photovoltaic cells can use less than 1 percent of the expensive raw material (silicon or other light absorbers) compared to wafer based solar cells, leading to a significant price drop per Watt peak capacity. There are many research groups around the world actively researching different thin-film approaches and/or materials. However, it remains to be seen if these solutions can achieve a similar market penetration as traditional bulk silicon solar modules. One particularly promising technology is crystalline silicon thin films on glass substrates. This technology combines the advantages of crystalline silicon as a solar cell material (abundance, non-toxicity, high efficiency, long-term stability) with the cost savings of using a thin-film approach. The ultra-light, highly efficient solar cell was developed and is being commercialized by Emcore Corp. of [[Albuquerque], [[New Mexico, in partnership with the Air Force Research Laboratories Space Vehicles Directorate at Kirtland Air Force Base in Albuquerque. It represents a new class of solar cells with clear advantages in performance, engineering design, operation and cost. For decades, conventional cells have featured wafers of semiconducting materials with similar crystalline structure. Their performance and cost effectiveness is constrained by growing the cells in an upright configuration. Meanwhile, the cells are rigid, heavy and thick with a bottom layer made of germanium. In the new method, the cell is grown upside down. These layers use high-energy materials with extremely high quality crystals, especially in the upper layers of the cell where most of the power is produced. Not all of the layers follow the lattice pattern of even atomic spacing. Instead, the cell includes a full range of atomic spacing, which allows for greater absorption and use of sunlight. The thick, rigid germanium layer is removed, reducing the cell's cost and 94 percent of its weight. By turning the conventional approach to cells on its head, the result is an ultra-light and flexible cell that also converts solar energy with record efficiency (40.8 percent under 326 suns concentration). The invention of conductive polymers (for which Alan Heeger, Alan G. MacDiarmid and Hideki Shirakawa were awarded a Nobel prize) may lead to the development of much cheaper cells that are based on inexpensive plastics. However, all organic solar cells made to date suffer from degradation upon exposure to UV light, and hence have lifetimes which are far too short to be viable. The conjugated double bond systems in the polymers, which carry the charge, are always susceptible to breaking up when radiated with shorter wavelengths. Additionally, most conductive polymers, being highly unsaturated and reactive, are highly sensitive to atmospheric moisture and oxidation, making commercial applications difficult. Experimental non-silicon solar panels can be made of quantum heterostructures, eg. carbon nanotubes or quantum dots, embedded in conductive polymers or mesoporous metal oxides. In addition, thin films of many of these materials on conventional silicon solar cells can increase the optical coupling efficiency into the silicon cell, thus boosting the overall efficiency. By varying the size of the quantum dots, the cells can be tuned to absorb different wavelengths. Researchers located at the University of California, San Diego have come up with a way of making solar photovoltaic cells more efficient by making them fuzzy with indium phosphide nanowires. Many new solar cells use transparent thin films that are also conductors of electrical charge. The dominant conductive thin films used in research now are transparent conductive oxides (abbreviated "TCO"), and include fluorine-doped tin oxide (SnO2:F, or "FTO"), doped zinc oxide (e.g. : ZnO:Al), and indium tin oxide (abbreviated "ITO"). These conductive films are also used in the LCD industry for flat panel displays. The dual function of a TCO allows light to pass through a substrate window to the active light absorbing material beneath, and also serves as an ohmic contact to transport photogenerated charge carriers away from that light absorbing material. The present TCO materials are effective for research, but perhaps are not yet optimized for large-scale photovoltaic production. They require very special deposition conditions at high vacuum, they can sometimes suffer from poor mechanical strength, and most have poor transmittance in the infrared portion of the spectrum (e.g. : ITO thin films can also be used as infrared filters in airplane windows). These factors make large-scale manufacturing more costly. A relatively new area has emerged using carbon nanotube networks as a transparent conductor for organic solar cells. Nanotube networks are flexible and can be deposited on surfaces a variety of ways. With some treatment, nanotube films can be highly transparent in the infrared, possibly enabling efficient low bandgap solar cells. Nanotube networks are p-type conductors, whereas traditional transparent conductors are exclusively n-type. The availability of a p-type transparent conductor could lead to new cell designs that simplify manufacturing and improve efficiency. Despite the numerous attempts at making better solar cells by using new and exotic materials, the reality is that the photovoltaics market is still dominated by silicon wafer-based solar cells (first-generation solar cells). This means that most solar cell manufacturers are currently equipped to produce this type of solar cells. Consequently, a large body of research is being done all over the world to manufacture silicon wafer-based solar cells at lower cost and to increase the conversion efficiencies without an exorbitant increase in production cost. The ultimate goal for both wafer based and alternative photovoltaic concepts is to produce solar electricity at a cost comparable to currently marked dominating technologies like coal and nuclear power in order to make it the leading primary energy source. To achieve this it may be necessary to reduce the cost of installed solar systems from currently about US$ 1.80 (for bulk Si technologies) to about US$ 0.50 per Watt peak power. Since a major part of the final cost of a traditional bulk silicon module is related to the high cost of solar grade poly silicon feedstock (about US$ 0.4/Watt peak) there exists substantial drive to make Si solar cells thinner (material savings) or to make solar cells from cheaper upgraded metallurgical silicon (so called "dirty Si"). IBM has a semiconductor wafer reclamation process that uses a specialized pattern removal technique to repurpose scrap semiconductor wafers to a form used to manufacture silicon-based solar panels. The new process was recently awarded the “2007 Most Valuable Pollution Prevention Award” from The National Pollution Prevention Roundtable (NPPR). Researchers at Idaho National Laboratory, along with partners at Microcontinuum Inc. (Cambridge, MA) and Patrick Pinhero of the University of Missouri, have devised an inexpensive way to produce plastic sheets containing billions of nanoantennas that collect heat energy generated by the sun and other sources, which garnered two 2007 Nano50 awards. The technology is the first step toward a solar energy collector that could be mass-produced on flexible materials. While methods to convert the energy into usable electricity still need to be developed, the sheets could one day be manufactured as lightweight "skins" that power everything from hybrid cars to computers and iPods with higher efficiency than traditional solar cells. The nanoantennas also have the potential to act as cooling devices that draw waste heat from buildings or electronics without using electricity. The nanoantennas target mid-infrared rays, which the Earth continuously radiates as heat after absorbing energy from the sun during the day; also double-sided nanoantenna sheets can harvest energy from different parts of the sun's spectrum. In contrast, traditional solar cells can only use visible light, rendering them idle after dark. Also Konarka is researching infrared light activated photovoltaics which would enable night-time power generation. Three-dimensional solar cells that capture nearly all of the light that strikes them and could boost the efficiency of photovoltaic (PV) systems while reducing their size, weight and mechanical complexity. The new 3D solar cells capture photons from sunlight using an array of miniature “tower” structures that resemble high-rise buildings in a city street grid. With a reflective coating, developed at RPI, the material absorbs 96.21 per cent of incident sunlight. This gain in absorption was consistent across the entire spectrum of sunlight, from UV to visible light and infrared. Such a method tackles the problem of absorbing sunlight evenly and equally from all angles. The seven layers, each with a height of 50-100 nm, are made up of silicon dioxide and titanium dioxide nanorods positioned at an oblique angle. Each layer looks and functions similar to a dense forest where sunlight is "captured" between the trees. The nanorods were attached to a silicon substrate via chemical vapor disposition and the new coating can be affixed to nearly any photovoltaic materials for use in solar cells, including III-V multi-junction and cadmium telluride. Researchers at Duke University and Boston College have engineered a metamaterial that utilizes tiny geometric shapes to absorb both the electrical and magnetic properties of electromagnetic waves over a certain frequency range at a level that meets standards of scientific perfection. This results in the total absorption of light, turning it into heat, which can then create energy. National Renewable Energy Laboratory tests and validates solar technologies. There are three reliable certifications of solar equipment: UL and IEEE (both U.S. standards) and IEC. Solar cells are manufactured primarily in Japan, China, Germany, Taiwan, and the USA, though numerous other nations have or are acquiring significant solar cell production capacity. While technologies are constantly evolving toward higher efficiencies, the most effective cells for low cost electrical production are not necessarily those with the highest efficiency, but those with a balance between low-cost production and efficiency high enough to minimize area-related balance of systems cost. Those companies with large scale manufacturing technology for coating inexpensive substrates may, in fact, ultimately be the lowest cost net electricity producers, even with cell efficiencies that are lower than those of single-crystal technologies. ↑ Alfred Smee, Elements of Electro-Biology, or The Voltaic Mechanism of Man; of Electro-Pathology, Especially of the Nervous System (London, UK: Longman, Brown, Green, and Longmans, 1849). ↑ Z.I. Alferov, V.M. Andreev, M.B. Kagan, I.I. Protasov, and V.G. Trofim, "Solar-energy converters based on p-n AlxGa12xAs-GaAs heterojunctions." Fiz. Tekh. Poluprovodn 4:2378 (Sov. Phys. Semicond.) 4:2047 (1971). ↑ Zhores Alferov, Nobel Lecture. Retrieved February 27, 2017. ↑ 4.0 4.1 4.2 William P. Hirshman, Garret Hering, and Michael Schmela, "Market Survey: Cell & Module Production." Photon International, 152 (2008). ↑ 5.0 5.1 5.2 Martin A. Green, "Third generation photovoltaics: solar cells for 2020 and beyond." Physica E: Low-dimensional Systems and Nanostructures 14(1-2) (2002): 65–70. ↑ 6.0 6.1 6.2 What is the Energy Payback for PV?. nrel.gov. Retrieved November 27, 2017. ↑ 7.0 7.1 7.2 7.3 Gavin Conibeer, Third Generation Photovoltaics. Materials Today 10(11) (November 2, 2007). Retrieved February 27, 2017. ↑ 8.0 8.1 8.2 William P. Hirshman, Garret Hering, and Michael Schmela, "Market Survey: Cell & Module Production 2007." Photon International, 140–174. ↑ UD-led team sets solar cell record, joins DuPont on $100 million project. udel.edu. Retrieved February 27, 2017. ↑ Jennifer Kho, NREL, DARPA Both Claim Record Solar Efficiency. Green Tech Media, August 21, 2008. Retrieved February 27, 2017. ↑ Peter Würfel, Physics of solar cells (Weinheim, DE: Wiley-VCH, 2005, ISBN 3527404287). ↑ Eduardo Lorenzo, Solar Electricity: Engineering of Photovoltaic Systems (Sevilla, ES: Progensa, 1994, ISBN 8486505550). ↑ 13.0 13.1 Antonio Luque and Steven Hegedus, Handbook of Photovoltaic Science and Engineering (Hoboken, NJ: John Wiley and Sons, 2003, ISBN 0471491969). ↑ Jenny Nelson, The Physics of Solar Cells (London, UK: Imperial College Press, 2003, ISBN 978-1860943409). ↑ Solar Spectral Irradiance: Air Mass 1.5. National Renewable Energy Laboratory. Retrieved February 27, 2017. ↑ Silicon nanoparticle film can increase solar cell performance. AutoblogGreen. Retrieved February 27, 2017. ↑ Cheng-Hsiao Wu, and Richard Williams, "Limiting efficiencies for multiple energy-gap quantum devices." J. Appl. Phys. 54 (1983):6721. ↑ UD-led team sets solar cell record, joins DuPont on $100 million project. udel.edu/PR/UDaily. Retrieved February 27, 2017. ↑ M. Ito, K. Kato, and K. Komoto et al., "A comparative study on cost and life-cycle analysis for 100 MW very large-scale PV (VLS-PV) systems in deserts using m-Si, a-Si, CdTe, and CIS modules." Progress in Photovoltaics: Research and Applications 16 (2008):17-30. ↑ K.L. Chopra, P. D. Paulson, and V. Dutta, "Thin-film solar cells: An overview." Progress in Photovoltaics: Research and Applications 12 (2004):69-92. ↑ Richard Corkish, Can Solar Cells Ever Recapture the Energy Invested in their Manufacture? Solar Progress. 18(2) (1997):16–17. Retrieved February 27, 2017. ↑ String ribbon silicon solar cells with 17.8% efficiency. ece.gatech.edu. Retrieved February 27, 2017. ↑ Jehad AbuShama, Steve Johnston, Tom Moriarty, Glenn Teeter, Kannan Ramanathan, and Rommel Noufi, Properties of ZnO/CdS/CuInSe2 with Improved Performance. Progress in Photovoltaics: Research and Applications. 12 (2004):39. ↑ Indium. minerals.usgs.gov. Retrieved February 27, 2017. ↑ Tuttle et el., Design Considerations and Implementation of Very-Large Scale Manufacturing of CIGS Solar Cells and Related Products. 20th European Photovoltaic Solar Energy Conference and Exhibition. Spain, 2005. ↑ Swanson, R.M. The Promise of Concentrators. Progress in Photovoltaics: Res. Appl 8 (2000):93-111. ↑ Triple-Junction Terrestrial Concentrator Solar Cells. Spectrolab. Retrieved February 27, 2017. ↑ J.Y. Kim, K. Lee, and N.E. Coates et al., Efficient tandem polymer solar cells fabricated by all-solution processing. Science 317(5835) (2007):222–225. ↑ A. Mayer, et al., Polymer-based solar cells. Materials Today. 10(11) (2007):28. ↑ P.I. Widenborg and A.G. Aberle, Polycrystalline silicon thin-film solar cells on AIT-textured glass superstrates. Advances in OptoElectronics. 2007. ↑ M.L. Terry, A. Straub, D. Inns, D.Y. Song, and A.G. Aberle, Large open-circuit voltage improvement by rapid thermal annealing of evaporated solid-phase-crystallized thin-film silicon solar cells on glass. Applied Physics Letters 86 (2005):3. ↑ Slicing Solar Power Costs with New Wafer-Cutting Method. Newswise Science News. (University of Utah) Retrieved February 27, 2017. ↑ T. Nohira, K. Yasuda, and Y. Ito, Pinpoint and bulk electrochemical reduction of insulating silicon dioxide to silicon.] Nat Mater. 2(6 ) (2003):397–401. ↑ X. Jin, P. Gao, D. Wang, X. Hu, and G.Z. Chen, Electrochemical preparation of silicon and its alloys from solid oxides in molten calcium chloride. Angew. Chem. Int. Ed. Engl. 43(6) (2004):733–6. ↑ M.A. Green, Consolidation of Thin-film Photovoltaic Technology: The Coming Decade of Opportunity. Progress in Photovoltaics: Research and Applications. 14 (2006):383-392. ↑ M.A. Green, P.A. Basore, N. Chang, D. Clugston, R. Egan, R. Evans, D. Hogg, S. Jarnason, M. Keevers, P. Lasswell, J. O'Sullivan, U. Schubert, A. Turner, S.R. Wenham, and T. Young, Crystalline silicon on glass (CSG) thin-film solar cell modules. Solar Energy 77 (2004):857-863. ↑ V. Terrazzoni-Daudrix, F.J. Haug, and C. Ballif et al., The European Project Flexcellence Roll to Roll Technology for the Production of High Efficiency Low Cost Thin Film Solar Cells. Proc. of the 21st European Photovoltaic Solar Energy Conference. 2006:1669-1672. ↑ EMCORE Receives AURP's Innovation Award for High-Efficiency Multi-Junction Solar Cells. Emcore Corporation, September 27, 2013. Retrieved February 27, 2017. ↑ R.M. Swanson, A Vision for Crystalline Silicon Photovoltaics. Progress in Photovoltaics: Research and Applications. 14 (2006):443-453. ↑ IBM Pioneers Process to Turn Waste into Solar Energy - United States. IBM Press room. Retrieved February 27, 2017. ↑ 3D Solar Cells Boost Efficiency While Reducing Size, Weight and Complexity of Photovoltaic Arrays. gtresearchnews.gatech.edu. Retrieved February 27, 2017. Lorenzo, Eduardo. Solar Electricity: Engineering of Photovoltaic Systems. Sevilla, ES: Progensa, 1994. ISBN 8486505550. Luque, Antonio, and Steven Hegedus. Handbook of Photovoltaic Science and Engineering. Chichester, UK; Hoboken, NJ: John Wiley and Sons, 2003. ISBN 0471491969. McDonald, S.A., G. Konstantatos, S. Zhang, P.W. Cyr, E.J. Klem, L. Levina, and E.H. Sargent. Solution-processed PbS quantum dot infrared photodetectors and photovoltaics. Nature Materials. 4(2) (2005):138–42. Nelson, Jenny. The Physics of Solar Cells. London, UK: Imperial College Press, 2003. ISBN 978-1860943409. Würfel, Peter. Physics of solar cells. Weinheim, DE: Wiley-VCH, 2005. ISBN 3527404287. Howstuffworks.com: How Solar Cells Work. Article describing the CdTe-based, high efficiency solar cell. Quantic photovoltaic cell - 65% efficiency. This page was last modified on 27 February 2017, at 16:19.